Written in 1906, Gaubert's “Nocturne et Allegro Scherzando” is highly typical of what Paris Conservatory composers would write through the next several decades: music flirting with contemporary trends but remaining essentially conservative in order to showcase the lyrical as well as technical abilities of the players. The Nocturne settles into the piano with mysterious impressionistic harmonies evolving from an unharmonized opening motif. 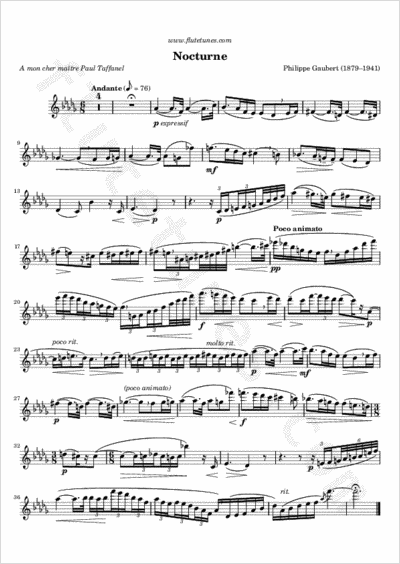 The flute arrives with a gentle melody that initially seems like standard salon material, but within a few measures it wanders off chromatically and takes on the sensuous character associated with flute music by the slightly older Debussy.